Soft Light tool in action. 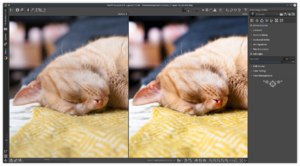 This tool emulates the effect of blending an image with a copy of itself in "soft-light" mode in GIMP. The resulting image has a little extra contrast and saturation, which is usually visually pleasing. This page was last edited on 17 December 2018, at 14:13.